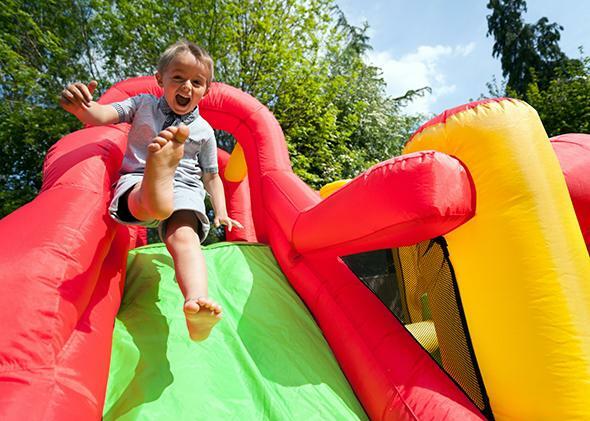 Bounce house hysteria: The biggest dangers to your kids this summer are not inflatable. The biggest danger to your kids this summer is not a bouncy house. There are more important things to be afraid of, like dog bites. Photo by Brian A. Jackson/Shutterstock. I can’t imagine how horrifying these incidents must have been for the parents and kids involved. But an epidemic? Really? It might be wise to avoid bouncy houses on windy days, make sure they’re not overcrowded and, by all means, please do check that they have been staked to the ground before letting little Lena inside. But let’s put things in perspective. Bouncy houses, while potentially dangerous, don’t deserve to be the target of this summer’s collective parental angst. As summer party season gets into full swing, here are some things we should worry a tad more about—and other things we really ought to stop freaking out about. Swimming pools. Drowning is the leading cause of injury-related death among 1- to 4-year-olds, and most of these deaths occur in home pools. Even when drowning isn’t fatal, it can cause serious brain damage and long-term disability. Research suggests that formal swimming lessons can reduce the risk of drowning in young kids by up to 88 percent. It’s also a good idea to install an isolation fence around your pool to keep out wanderers. Finally, remember: Drowning doesn’t always look like drowning. Toy balls. According to the Consumer Product Safety Commission, more than twice as many kids in 2012 were treated in emergency rooms for injuries related to toy balls than they were in 2010 for bouncy-house related injuries. The most common reason: Kids choke on balls. Dog bites. Every year, more than 40 times as many kids require medical attention for dog bites than they do for bouncy house injuries. Although it’s unclear what proportion of these bites come from family dogs versus unfamiliar ones, the U.S. Centers for Disease Control and Prevention recommends that parents teach children never to approach an unfamiliar dog, to stay motionless when approached by one, and to roll into a ball and be still if knocked over by one. Insects. Tick-borne Lyme Disease, rampant in the Northeast and upper Midwest in the summer months, is most common among boys aged 5 to 9 and can spread to the nervous system, heart, and joints if untreated. Here’s some info on how to protect against tick bites and remove embedded ticks. (I’ve already found one on my son this year.) In 2013, every U.S. state reported cases of mosquito-borne West Nile Virus, which can, in rare instances, be fatal. And just last week, the Florida Department of Health confirmed that mosquito-borne Dengue fever has afflicted 24 Floridians and mosquito-borne Chikungunya virus has infected 18 Floridians since the beginning of 2014. Although both diseases are still rare in the U.S., rates are increasing; worse, both are painful, debilitating and basically untreatable. DEET. Parents love to freak out about it, but the fact is, DEET works, reducing the risk of those nasty insect-borne diseases mentioned above, and it’s safe. Its bad rap, as science writer Brooke Borel explained in Slate last year, comes from a handful of reports in the 1980s linking its use to seizures, but studies published since suggest it not dangerous for kids—in fact, it’s potentially safer than some “natural” plant-based bug sprays. Amusement rides. Mishaps and accidents from rides at amusement parks, fairs and carnivals only led to a total of 5,900 ER visits—by adults and children—in 2004, the last year for which data are available. Home playsets. Truth be told, nearly five times more kids are treated each year for home-playset-induced injuries than for bouncy house-related ones. But kids use home playsets far more frequently than they do bouncy houses, so the risk per use is likely much lower. Some things to keep in mind: On public playgrounds, most injuries come from falls off of climbing structures, whereas at home, swings are the biggest culprit, thanks to high-speed dismounts and kids getting hit by swinging kids. The fact is, pretty much everything about the outdoors can be potentially risky for children. But constantly trying to protect them from danger has its own risks. My husband built a playset in the yard a few weeks ago and yes, my son has already fallen face-first off the 5-foot-high platform. It’s a miracle he didn’t end up in the ER. But I daresay the experience has given him a profound new respect for gravity, which isn’t a bad thing. Plus, the equipment has taught him some important life skills, such as how to climb ladders. (Ones with safety handles, anyway.) As for what I will do if he suddenly develops a love for bouncy houses? I’ll let him play in them. But not before I’ve checked that they’ve been properly been secured to the ground.